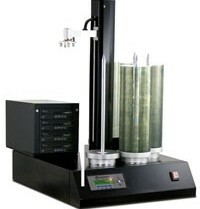 The HCL Autoloader is also available as a Blu-ray Disc or LightScribe duplicator. The HCL autoloader is also available as a CD/DVD only or LightScribe duplicator. Rid yourself of the painstaking task of manually producing one LightScribe disc at a time. Now, with Microboards' latest high-volume creation, produce mass quantities of LightScribe CDs and DVDs automatically, completely unattended! Stack blank LightScribe discs on the spindles with the master disc on top. The HCL will read the master disc and make 4, 6, or 8 copies at a time of the remaining discs. To print an image, simply flip the discs over, place them back on the spindle, and repeat the process, this time with the HCL etching a picture-perfect label. Save yourself plenty of time and effort! The HCL (high capacity loader) units feature a high-tech robotic arm that picks up the discs from the spindle and places them into the recorders. When recording is complete, the arm removes the discs and places them in the output location, then refills the drives. After setting up and programming the HCL, it's a completely "hands off" process! Microboards LightScribe HCL Autoloader is perfect for use in environments that needs to produce more than 100 discs at a time. The LightScribe HCL Autoloaders are offered with either four, six, or eight recorders. Autloaders are also available in CD/DVD and Blu-ray models. The HCL autoloader is also available as a CD/DVD only or Blu-ray Disc duplicator. This page was updated Tuesday, July 21, 2009 at 2:04pm by Microboards Marketing Department.